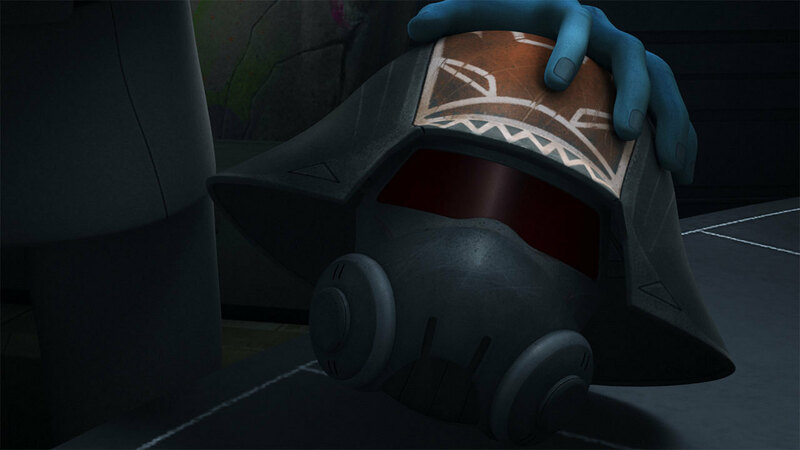 Were secrets revealed with the Empire learning Fulcrum’s identity on last week episode of Star Wars Rebels “Through Imperial Eyes.” This recap will follow events and details in the episode and bring viewers up to speed before tonight’s new episode. 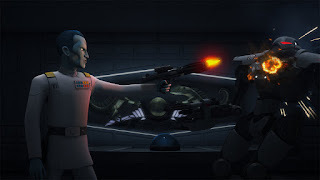 This episode which was initially supposed to be seen and viewed like a first-person shooter game and that person be Agent Kallus did not happen. They scrapped the idea, and they kept the first-person perspective only for the beginning shot in the episode. So, without further a due SPOLIERT ALERT is in effect and from this moment on and for the remainder of this recap. 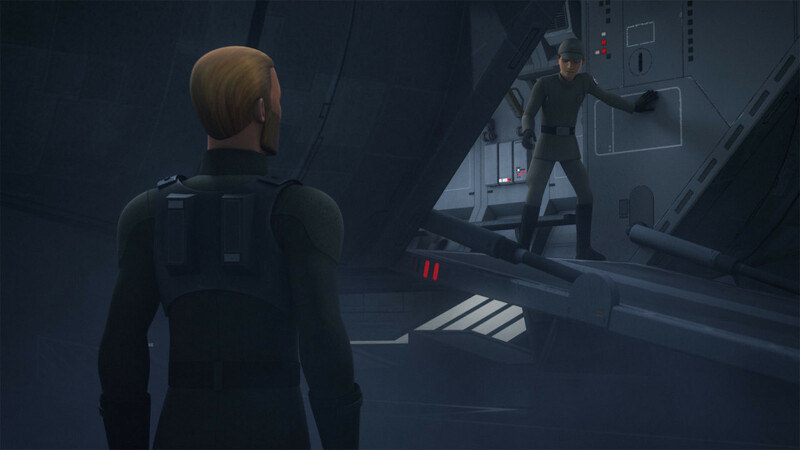 This episode does start off from the perspective of Agent Kallus who is woken by alarms alerted to a ship being captured escaping from Lothal. We see Agent Kallus waking up and putting water on his face getting ready to see who was caught. The perceptive ends and we meet Lieutenant Lyste who is excited to have captured someone who he believes is a low-level rebel. 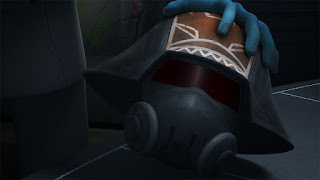 But when the prisoner is helmet is removed we see that is Ezra Bridger whose identity is not known to all in the Empire. 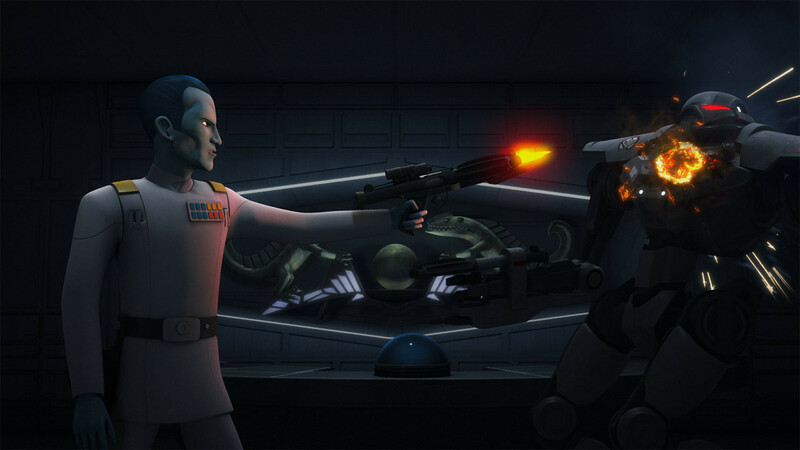 Ezra starts off screaming at Agent Kallus who is confused by his capture and arrival on his ship. 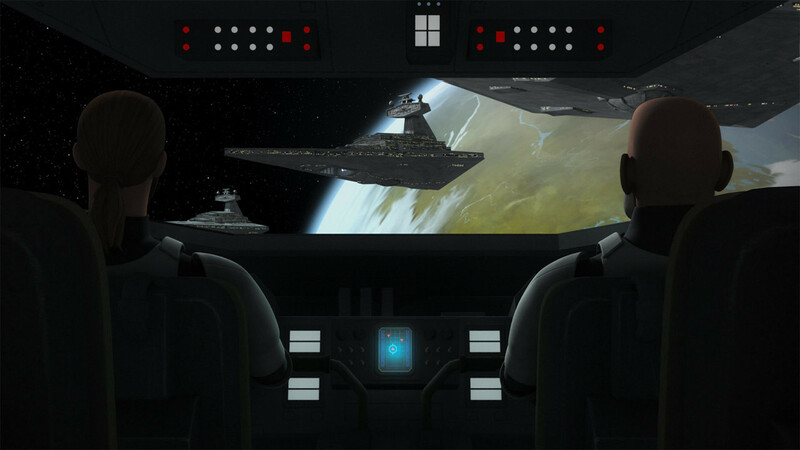 The vessel also has AP-5 and Chopper aboard who are freely roaming the ship by telling them they are witnesses to the rebel’s crimes. Things just get worse from that point on because Grand Admiral Thrawn is making an appearance and wants to see Agent Kallus and Lieutenant Lyste at once. The two are now standing outside his quarters and must give identification before entering. The walk in and are stunned by seeing Grand Admiral Thrawn sparring with assassin droids and winning. He calls out a name which is sort of like a safe word and the droids turn off and they are motion into another room where they meet a familiar face to them and the viewers. 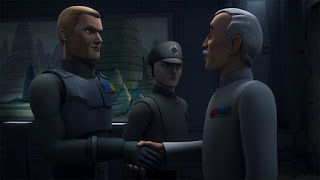 Colonel Yularen who is an old mentor to Agent Kallus and a character from the clone wars series and he served under General Skywalker. He has been brought in by Grand Admiral Thrawn to uncover the rebel spy in the midst, who they believe could be a high-ranking officer. Once they are dismissed Agent Kallus starts to think of a way to get ahead of the situation and uses Lieutenant Lyste in a brilliant plan. He tells Lieutenant Lyste to keep an eye on Governor Pryce who was late to the meeting because she might be the spy and Lieutenant Lyste believes him and follows her around the ship. Before Lieutenant Lyste leaves Agent Kallus grabs his identification to use it to frame him as the rebel spy. The next scene shows Agent Kallus freeing Ezra and asking him why he came here in the first place. Ezra responds that they believe Agent Kallus is in danger of being found out due to some transmissions being picked up by the Empire. Agent Kallus also reviles that the Empire is getting close to finding Chopper base, so he wants Ezra to tell him the location of the base. Not actually trusting each other they decide to go together to Grand Admiral Thrawn’s quarters to get codes to escape and to remove the location of Chopper base off Grand Admiral Thrawn’s map. 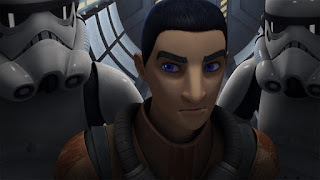 They find some clothing for Ezra that is like Lieutenant Lyste uniform and head to Grand Admiral Thrawn’s quarters. 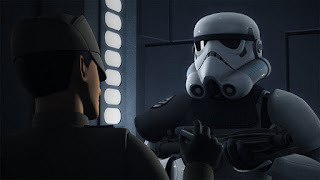 Once they reach the Grand Admiral Thrawn’s quarters, Ezra uses Jedi mind tricks on the Stormtrooper to see him as Lieutenant Lyste, and they hand him Lieutenant Lyste identification. 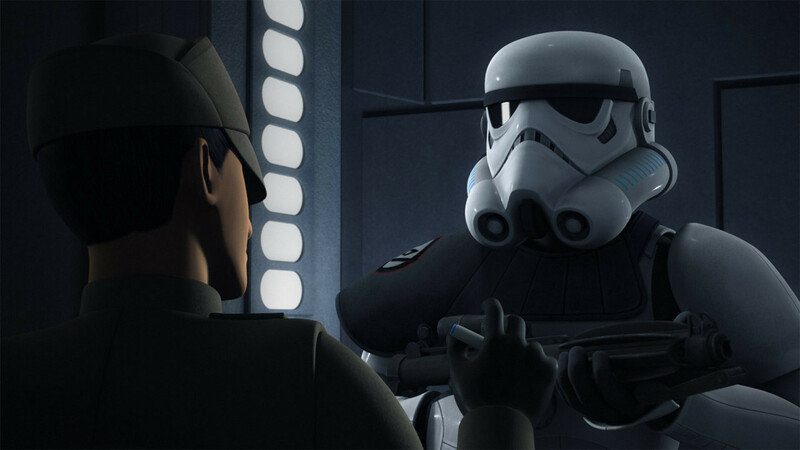 They enter and receive the codes to give to Kanan and Rex who are on route in Stormtrooper disguise to rescue Ezra and Agent Kallus. Ezra views Grand Admiral Thrawn’s Map and removes Chopper base and replaces it with another planet. Meanwhile, Grand Admiral Thrawn is heading to prisoner cells to meet the rebel that was captured only to see that the security cameras are down and the rebel is gone. 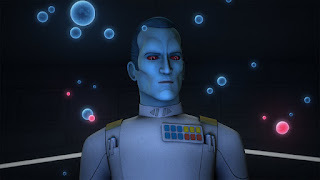 The Officer who identification turned it off was Lieutenant Lyste, and Grand Admiral Thrawn then returns to his quarters. 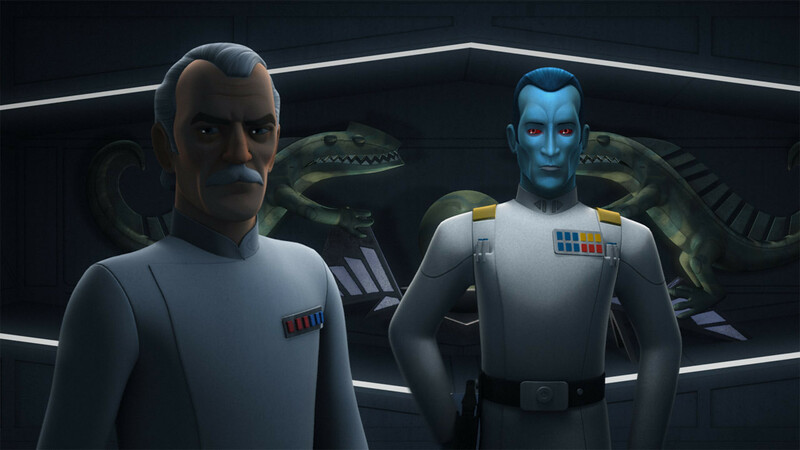 AP-5 warns Ezra and Agent Kallus who must come up with a distraction escape without being seen by Grand Admiral Thrawn. Ezra hides behind a painting, and Agent Kallus leaves the room. Grand Admiral Thrawn enters and is meet by his assassin droids who are not responding to his shut off command. Ezra escapes with Agent Kallus as they run to meet up with Kanan and Rex. Grand Admiral Thrawn fights off the assassin droids and tries to chase after the rebel and Lieutenant Lyste who they believe is the spy. 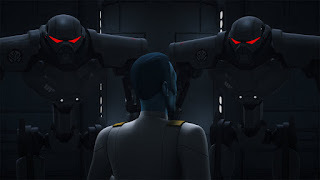 Once Kanan and Rex land they are meet be Governor Pryce who tries to capture them and is stunned by Lieutenant Lyste who thinks she was trying to escape with the rebels. At the same moment, Colonel Yularen sees him shoot Governor Pryce. This allows Ezra to escape, but Agent Kallus decides to stay behind saying that he is more useful as a spy to remain with the Empire. 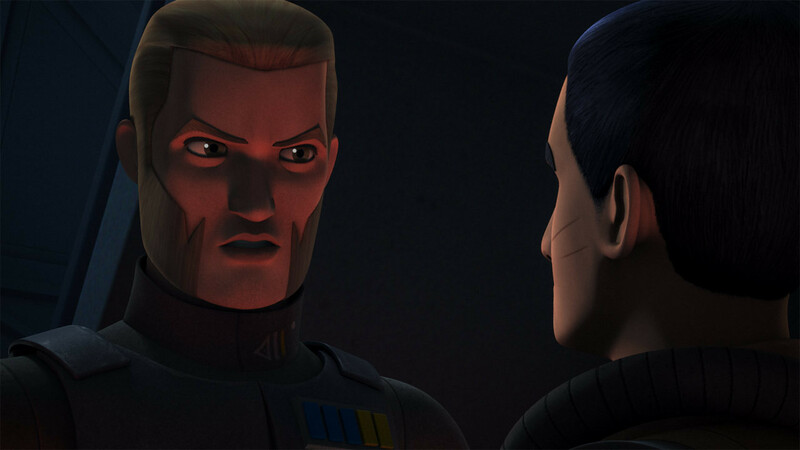 They Escape, and Agent Kallus puts Lieutenant Lyste under arrest for assisting the rebels in the escape and as the rebel spy.